This is my 4th RIB. First was a 6.4m Osprey with a V6 inboard. 2nd was a RC 585 with a 175 Ficht RAM. 3rd was a 6.4RC with twin 115 Etecs, 4th is the current one, which could quite possibly be the last one. The 545 is an oddball one off design by George Marvin who was involved with the early Searider designs. The current line up of RC boats are variations of a common design, not related to the 545, which sits between the 5.3 & 5.85. The 545 is a completely different design & to make one involves changing the tooling, so they aren't promoted. It's not a fast boat due to the full length deep V, no planing pad. Also, it's a heavy beast for its size, all this give a very sea worthy hull that will never win any races. I only know of 2 on Ribnet, mine & Hadds Mr Jingles. I've tended to change boats as my needs change. 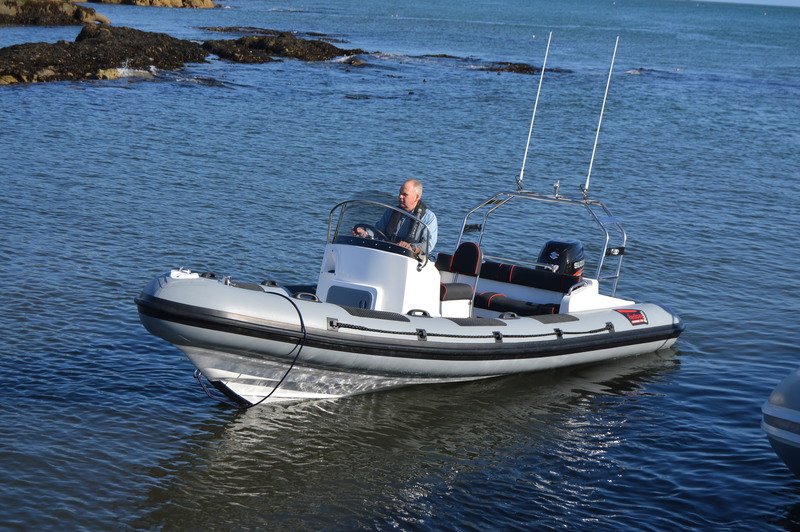 The Osprey was bought second hand as a dive boat & we wore it out & scrapped it. All the RCs have been bought new, the 585 was a dive platform for conventional open circuit diving, then I got into rebreathers & wanted to venture further offshore with more gear, so the twin engines 6.4 came along. Now there's just me & the missus & I've all but hung up my fins, now it's mostly cruising & fishing. We wanted something easier to tow & launch, but still with serious offshore capabilities, hence the 545. Apart from the Osprey, all the boats have been sold in immaculate condition. Unless our circumstances change, I'd expect the current BP to last 15 years or so. Yup, heavy lay up boat, 170l of fuel, 140hp engine, twin batteries, Ullmans, anchor + twin axle trailer, 2spare wheels, electric winch+battery. It soon adds up. Do you know your trailer weight ? Mine highfield 5,4m on trailer real weight is 1250 kg with 2x batteries, 100l of fuel, gears for 5 people. I was thinking about 6.1 Redbay or 5.8 Ribcraft but I do really need fancy rear and wide bench which Redbay make. We have a lot of gears for 5 x (fins, masks, automatic life jackets, neoprene suits, spare shoes even - we use in Grece neoprene shoes for swimming but for exploring coast "normal" are better). So current locker under bench till transom is full. Id imagine unless the op Carries a lot of gear in the boat or buys a particularly heavy boat he will be fine. I find boats tow better than other trailers ie caravans and box trailers due to the wheels being so far back. There shouldn't be any problems with the car up to its max braked weight and he should find a boat within his wish list under that weight. I'd imagine most genuine sellers wouldn't mind getting a weighbridge ticket if it meant ensuring a sale. Obviously the "this is a bargain pay me now before I sell to another (ficticious) buyer" brigade might not like the inconvenience but most sellers are aware that the "right" buyer needs to be accommodated. The usual way to go is after viewing agree to purchase subject to sea trial maybe after agreeing a small non refundable deposit to cover time & expenses if you don't buy. You could make a visit to a weighbridge on the way back from sea trial part of the condition of purchase, assuming the seller is of the opinion the boat is below your max weight.